A vendor has the ability to create additional affiliate tracking links, outside of the auto-generated default tracking link created by PayKickstart for each funnel. This is perfect for those vendors who have multiple landing pages (pre-launch pages, webinar pages, etc…) or marketing strategies for driving traffic through a funnel. To start creating additional affiliate links, go to Affiliates >> Links in the vendor navigation. Then click on the “New Link” button in the top right side. 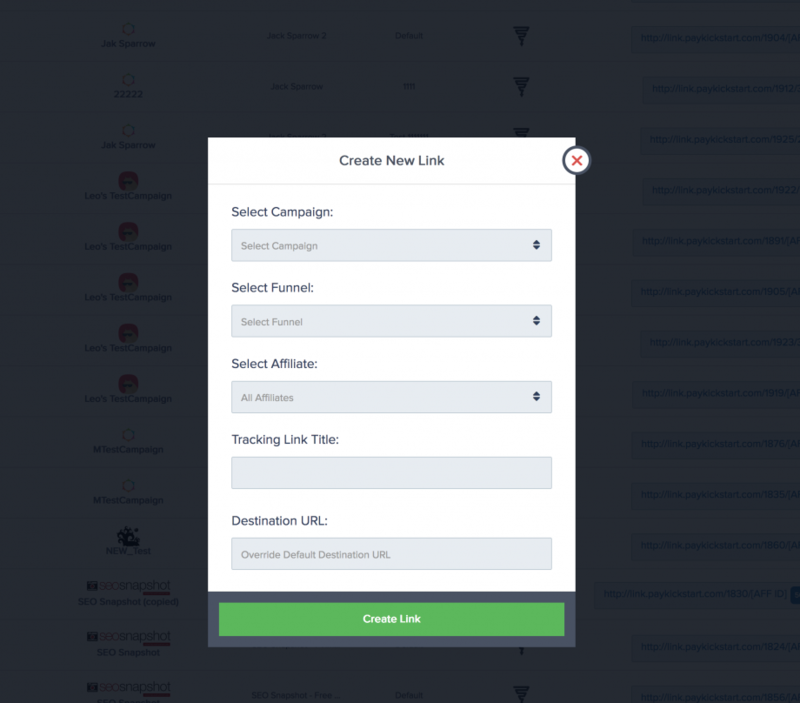 Select the Campaign and Funnel the new tracking link should be associated with. Then select either All Affiliates or specify individual affiliates who should have access to this tracking link. Give your tracking link a unique name for identification purposes and specify the Destination URL where the tracking link will redirect to. Optionally if you leave the Destination URL blank, it will redirect to the default landing page per your funnel settings. Once created, your affiliates will see the newly created affiliate tracking link in there account to start promoting. It will cookie/track each visitor and associate them with the Campaign, just like any normal affiliate link.